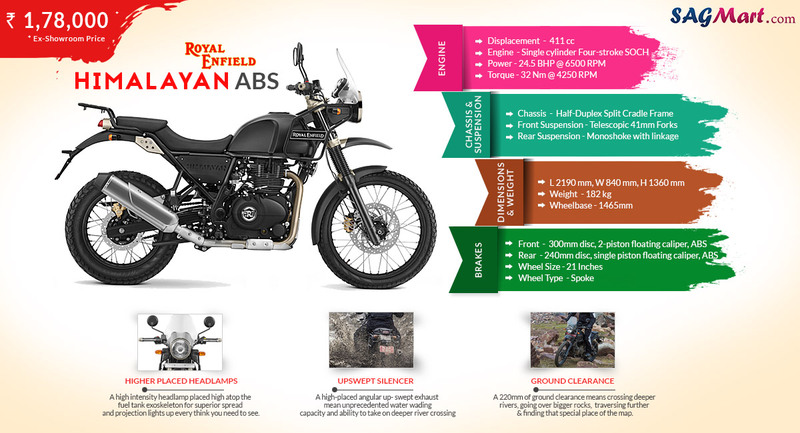 Royal Enfield Himalayan ABS is the evolved version of the existing regular model in Indian lineup at the safety front. For this updated model with ABS, the company will ask around INR 1.78 lakh, ex-showroom, Mumbai. Apart from the addition of ABS, the motorcycle did not see any modifications at the cosmetics and mechanicals. It will continue to get power from the same 411cc, single-cylinder, fuel injected motor of the ongoing model with the churned power of 24.5 bhp and 32 Nm via a mated five-speed gearbox.